Origin and Habitat: Encephalartos tegulaneus (ssp. tegulaneus) occurs in large subpopulations in fairly remote and inaccessible parts of Matthews Range in the Rift Valley Province in central Kenya. The main areas are on the Ndoto, Warges and Lololokwi hills and near Barsaloi. Number of Locations 6. It is difficult to estimate the total population size of this subspecies due to the inaccessible terrain but it is considered that there are at least 5,000 to 10,000 mature individuals in the wild. Altitude range: 1,400 up to 2,300 metres above sea level. Habitat and Ecology: This subspecies grows on steep mountain slopes and on exposed rock outcrops in bushland (savanna) or in thick dry forest. In some cases this subspecies has been used traditionally where stems have been hollowed out to serve as cattle drinking troughs. However populations seem to be stable and there is no known decline. Reproduction is probably very slow, with many of the seeds eaten by baboons or wild pigs. Generation Length about 70 years. A more southern subspecies is known from only a single hill near Mt Kenya (Encephalartos tegulaneus subsp. powysii). subsp. powysii is assessed as Critically Endangered. It has a very limited distribution (being known from only a single hill) and is in decline owing to its collection from the wild for ornamental purposes. Description: Encephalartos tegulaneus is a very rare large palm-like cycad, its trunk to 7 m tall and 50 cm in diameter is erect or reclining. Leaves are grey green, about 1.2-2 m long and form a bowl shaped, inward facing leaf crown. Encephalartos belongs to a group of cycads known only from Africa, they are gymnosperms and produce naked seeds, just as conifers (pine trees) do. So even though they look like palms, they are actually more closely related to the pines and are members of a much more ancient group. 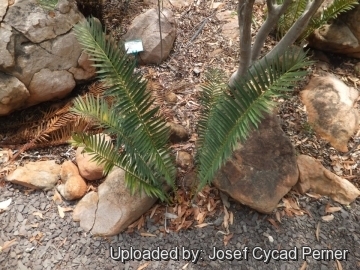 Cycads date back to before the time of the dinosaurs. Encephalartos tegulaneus was first collected by Joy Adamson, author of the bestseller Born Free - the woman who loved Elsa the lion - in May 1954. Three years later Encephalartos tegulaneus was described as a new species distinguished by yellow cones, long-stalked pollen cones and cylindrical seed cones. Two subspecies are recognized, the nominate form and Encephalartos tegulaneus ssp. powysii. Encephalartos tegulaneus is dioecious (has separate male and female plants). Derivation of specific name: The specific epithet is derived from the Latin 'tegula', tile, referring to the overlapping microsporophylls, resembling roof tiles. Trunk: Very large, usually unbranched, either erect, or or sometimes procumbant (curving down and up again) up to 7 m tall and 50 cm across (occasionally up to 10m long and 0.6-1m in diameter). The trunk is covered in leaf scars. Leaves (fronds): There are many leaves per trunk and each leaf is 1–1.8 m long (occasionally up to 3 metres in cultivation) and pinnate (divided into leaflets) oblanceolate, tapering gradually to the base, light or bright green or blue green, semiglossy, flat (not keeled) in section (opposing leaflets inserted at 180° on rachis). Rachis green, straight, stiff, not spirally twisted. Petiole straight, with more than 12 spines. Leaflets, lanceolate, stiff, leathery 16–22(-31) cm long, (1.5) 2–3 cm wide, with 26–40 parallel nerves, weakly discolorous, not lobed, insertion angle obtuse (45-80°), bearing spiny teeth on the margins near the leaflet base(1-3 teeth), margins recurved; upper margin lightly toothed, leaf-base collar not present. Basal leaflets reducing to spines. Male cones: 3-6, green or yellow, narrowly ovoid to subcylindrical 40–52 cm long, (9-)10-13(-14) cm across on a stalk up to 20 cm long and 2.5 cm. diameter, tapering to the base. Median scales rhomboidal, 45–50 mm long. Female cones: 3-6, ovoid, green or yellow, up to 40–68 cm long, (16-)19-25(-30) cm wide. Seeds: Ellipsoid-oblong, sarcotesta orange-red, 30–37(-40) mm long, 22–23(-30) mm wide. 1) Donaldson, J.S. 2010. Encephalartos tegulaneus. The IUCN Red List of Threatened Species 2010: e.T41911A10591971. http://dx.doi.org/10.2305/IUCN.UK.2010-3.RLTS.T41911A10591971.en . Downloaded on 20 September 2015. 4) Melville, R. "Flora of Tropical East Africa: Gymnospermae." Crown Agents, London.1958. 5) Beentje, H.J. , E. Tredwell “Encephalartos tegulaneus (lpision)” Board of Trustees of the Royal Botanic Gardens, Kew. Downloaded on 20 September 2015. 6) Beentje, H.J. "Kenya Trees, Shrubs and Lianas." National Museums of Kenya, Nairobi. 1994. 7) Miringu, B.W. & Beentje, H.J. "Encephalartos tegulaneus subsp. 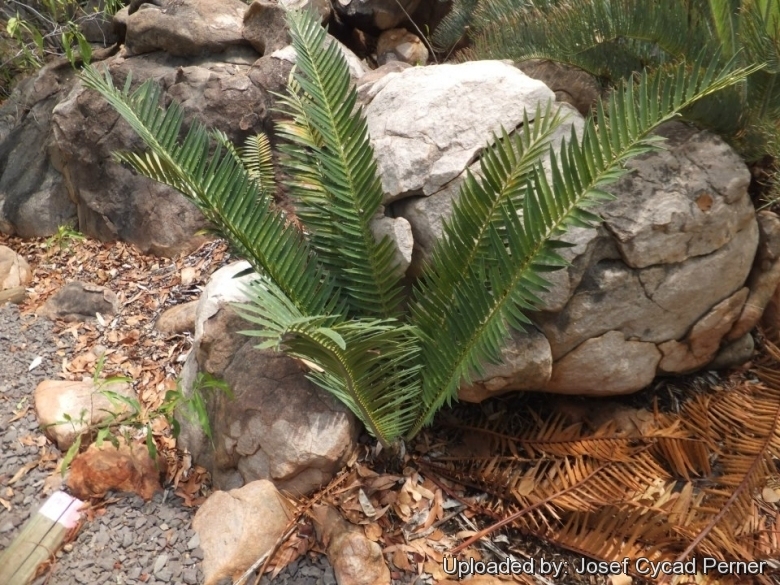 powysii (Zamiaceae): a new cycad in central Kenya". Journal of East African Natural History 88: 35–39. 1999. 8) PACSOA contributors "Encephalartos tegulaneus". In: Cycads. Palm and Cycad Societies of Australia (PACSOA) <http://www.pacsoa.org.au/wiki/Encephalartos_tegulaneus>. 23 November 2013 Web. 28 August 2015. Cultivation and Propagation: Encephalartos tegulaneus needs a moist, well-drained, frost-free position, in full sun or shade. As a garden subject, Encephalartos tegulaneus is one of the most spectacular of all cycad species and is quite adaptable in cultivation. The seedlings grow rapidly, developing into an attractive garden plant with 1 m long leaves in four to five years. Although slow-growing as a seedling, this plant grows more rapidly once it is about five years old and responds well to cultivation provided it has a well-drained soil, frost-free conditions and regular watering during the dry months. It is an adaptable plant well suited to subtropical climates. It can be grown in full sun without its leaves burning. When young they can be grown as a container plant and eventually transplanted into the garden. As a garden plant, this cycad will usually hold two or three crowns of leaves, all in good condition. It is one of the larger species of Encephalartos and has excellent landscape potential if your garden can handle a larger plant.. Growing rate: In cultivation this cycad is very easy to grow and grows quickly. Needs a large garden due to its size. It likes water and regular feeding and if it finds the right spot in the garden, will grow remarkably well. Seedlings can be a little slow to get started for the first couple of years if they are grown in containers which do not allow room for the tap root to develop. Hardiness: Frost sensitive (USDA zones 10-12) . However it exhibits an unusual amount of cold tolerance by surviving in Mediterranean areas as well. In the warmer portions of southern California it grows with apparent ease, only suffering defoliation or leaf burn during extreme winters. Known hazards: Many members of the Zamiaceae are poisonous, producing toxic glycosides known as cycasins, one should use gloves when handling or cleaning them.